We hear it all the time from Colorado newcomers, "I moved here for the outdoors." We can't blame them - it's in large part what has kept us here for more than 30 years. It's a convenient delight to walk out our front door onto miles of walking paths (such is the case in many of our communities)... but we don't have to go much further to find nationally-recognized walking, hiking, and biking trails, too. Here are five of our favorite (free!) trails. And five strong reminders why we all came here to begin with! There are countless trails and experiences to be had in Cheyenne Canyon. You'll find hiking and biking opportunities for every ability, as well as a variety of scenery, from waterfalls to vistas. Some areas are dog and horse-friendly, too. Click here for a full list of trails. This historic trail on the Northern slope of Pikes Peak is about 6.5 miles round-trip and boasts over 1,300 feet in elevation gain. 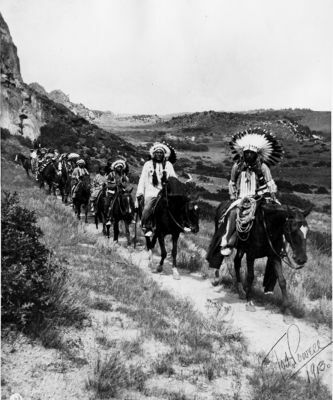 It is one of the oldest migratory trails in the United States; the Ute Indians forged the trail to travel the pass, which then became a route for buffalo, and eventually a wagon road beginning in the 1860s. Today, the Ute Pass Trail is suitable for hiking, biking and even horses. Learn more. We often forget, as locals, how lucky we are to have this national treasure in our own backyards. It boasts both paved and gravel trails that wind throughout the park, providing stunning views of Pikes Peak and, of course, the iconic red rock formations. There are easy to moderate trails lasting 1/2 hour to 4 hours in duration. Learn more. Located right in the heart of the city, Austin Bluffs Open Space offers 585 acres of views, unique rock formations, and trails of easy to moderate difficulty. There are two trailheads, accessed through the University Park neighborhood. Learn more. This moderate trail starts just south of Manitou Springs and offers a lot of variety in its 6-mile stretch. You'll enjoy views of Garden of the Gods (without the tourists that flock to the park), as well as Red Rocks Canyon, a small waterfall, and a nice overlook from the top of a series of switchbacks. Learn more.